The inaugural ACEN Nursing Education Accreditation Conference, Quality Education Through Accreditation, was a tremendous joy to host. The event attracted more than 450 attendees, 30+ vendors, featured over 40 concurrent sessions, 16 poster presentations, and a crowded Knowledge Café! We would like to thank everyone who participated in the conference, from attendees and presenters, to exhibitors and volunteers. Please make sure that you save the date for the second annual conference, taking place at the Atlanta Marriott Marquis from July 18 to 20, 2019. Registration will open at the beginning of October. We look forward to reading your submission, and if you have any questions, please don’t hesitate to reach out to annualconference@acenursing.org! We are all aware of the multitude of honor societies that acknowledge academic excellence. For the nursing profession, Sigma Theta Tau International Honor Society of Nursing (Sigma) is the highly respected organization that recognizes baccalaureate and graduate nursing students who demonstrate excellence in scholarship and to nurse leaders exhibiting exceptional achievements in nursing. Sigma has over 135,000 members representing more than 90 countries. Many of us are proud members of Sigma and have remained members for many years. Founded in 1922, Sigma has flourished for 90 years as the leader in scholarly nursing excellence. Since that time, the national nursing workforce has grown to nearly four million nurses, with roughly half of those nurses achieving their first academic degree in the community college setting. Recognizing the need to value and foster scholastic achievement of nursing students in community college, the Organization for Associate Degree Nursing (OADN) established the Alpha Delta Nu honor society in 2012. Alpha Delta Nu, or the ADN Honor Society, recognizes the nursing scholarship and academic excellence students and graduates of institutions that confer the Associate Degree in Nursing. Additionally, the society encourages the pursuit of advance degrees in the profession of nursing as well as continuing education as a life-long professional responsibility. Society chapters also participate in the active recruitment of qualified individuals into the profession of nursing. In addition to those scholarly pursuits, the honor society focuses on service as both a core value and means of leadership development. Inductees are required to sponsor an educational or recruitment project during the provisional membership period, prior to the induction ceremony and under the supervision of a faculty advisor. This opportunity has been addressed by inductees through a variety of innovative projects developed over the years. Some of the examples include: establishing a food bank on campus to address the unmet hunger needs of students, developing a campus wide educational module on the opioid epidemic called “Heroin Today, Gone Tomorrow: A Multidisciplinary Perspective of the Heroin Epidemic,” multiple recruitment events to educate high school students on the opportunities and rewards offered by a career in nursing, health fairs at homeless shelters, and many other worthwhile programs that serve communities and offer students an opportunity to lean an important community-based initiative or event. Alpha Delta Nu embodies the idea of academic excellence and scholarship, but the idea of equity opportunity to pursue those ideals is equally valued. For this reason, it is imperative that associate nursing students have the same opportunities as baccalaureate students. All nursing students should be distinguished for achieving excellence in their pursuit of education. Personally, I have had the pleasure of working with these inductees in a variety of capacities. One common thread is consistent; they are so proud of their achievements and wear their cord and pin with pride. Associate degree nursing programs that are members of OADN are welcomed to initiate a chapter. Since its inception Alpha Delta Nu has quickly grown to more than 140 chapters nation-wide in 6 short years. Why do I receive so many reports and letters when my program is undergoing an accreditation review? The report and letters you receive during the initial or continuing accreditation process are provided to the program so that the faculty are aware of each step of the peer review process. The peer review process includes three levels of peer review. The first level includes the site visit where peer evaluators verify, clarify, and amplify the information you submitted in the Self-Study Report. After the site visit is completed, the team submits their Site Visit Report in which they describe what they found during the visit and make recommendations regarding the program’s compliance with all Standards and Criteria and the accreditation status. The second level of review occurs when two (2) or more different peer evaluators complete an independent review and analysis of the Self-Study Report, Site Visit Report, Nurse Administrator Response Form, and additional materials (if applicable); they report their findings and recommendations to the Evaluation Review Panel (ERP). The ERP then makes its own recommendations regarding the program’s compliance with all Standards and Criteria and the accreditation status in an ERP summary. The third and final level of review is the Board of Commissioners (BOC). The BOC reviews the Self-Study Report, the Site Visit Report, ERP summary, Nurse Administrator Response Form, and additional materials (if applicable) to complete their own independent analysis and make the final decision about the program’s compliance with all Standards and Criteria and the accreditation status. 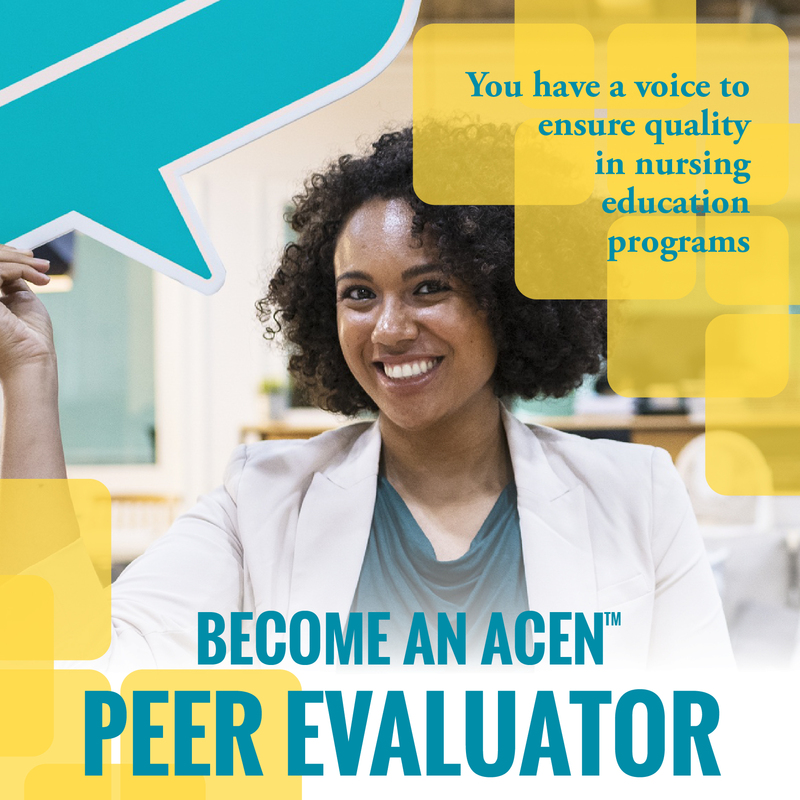 All recommendations and decision made by peer evaluators are based on their professional judgment and knowledge of the ACEN Standards and Criteria. If you have been through the peer review process before, you may have noticed the recommendations and the final decision may differ between each level of review. Each cycle, over 300 peer evaluators evaluate 80-120 individual nursing programs and submit their findings and recommendations. During the ERP meeting, reviewers examine all programs of the same type (practical, associate, diploma, baccalaureate, masters, doctorate) visited during the cycle. The ERP ensures all programs for that program type are treated fairly and recommendations are consistent; for example, if different teams have findings are essentially the same, but one team recommends an area needing development whereas another team recommends non-compliance, then it is up to the ERP to ensure consistent recommendations are made to the Board of Commissioners across the program type. The BOC examines all programs and all program types reviewed during the cycle. The BOC ensures all programs are treated fairly and decisions are consistent; for example, if the ERP’s findings are the essentially the same between panel types, but the associate degree panel recommends an area needing development whereas the master’s degree panel recommends non-compliance, then it is up to the BOC to ensure consistent decisions are made. What is the difference between an Area Needing Development and Non-Compliance? The summary of findings the program receives for each level of peer review is intended to assist faculty with program improvement. When each Criterion is evaluated, there are three (3) potential findings: Compliance, Compliance with Areas Needing Development, and Non-Compliance. Compliance means that the peer evaluators were able to find sufficient evidence that the program was in compliance with the Criterion being reviewed. Evidence may be found in the Self-Study Report and verified on site during the visit. If, however, the evidence is unclear or missing in the Self-Study Report, the peer evaluators may have clarified or found this information during the visit and included it in the Site Visit Report. An area needing development means that peer evaluators found evidence demonstrating that the nursing program is in compliance with an Accreditation Standard; however, evidence also demonstrated that opportunities for improvement were identified. An area needing development provides guidance to the program faculty members in their efforts to improve the quality of their nursing program between accreditation reviews. It is not uncommon for programs to have areas needing development. In fact, having peers from other organizations review your program and identify ways in which the program can be improved is one of the benefits of the peer review process. Non-compliance means that the peer evaluators were unable to find sufficient evidence that the program was in compliance with the Criterion being reviewed at the time of the review. When the Board of Commissioners decides that a program has not demonstrated compliance with a Standard(s), a Follow-Up Report will be required, and possibly a Follow-Up Visit per Policy #4 in the ACEN Manual. NOTE: programs seeking initial accreditation, all Standards must be found in compliance by the Board of Commissioners; however, areas needing development are acceptable. Essentially, the summary of findings represent the peer evaluators efforts to assist a programs faculty with their quality improvements efforts while ensuring a consistent and fair process for all. The timely review all the reports and letters you receive from the ACEN about each level of the review process is important. Paying special attention to any identified areas needing development can facilitate program improvement. And, critical reflection and development of an action plan for any areas of non-compliance is essential for success during the follow-up review process. The ACEN continuously looks for ways to reduce costs in order to maintain a fair and reasonable fee structure for programs. Effective January 1, 2019, the initial accreditation fee, as well as the annual accreditation fee, for international programs will be reduced. In addition to reducing fees, the international schedule of fees now includes services offered to domestic programs. Effective May 1, 2019, the daily site visit fee will be reduced. Beginning in the Fall 2019 Site Visit Cycle, programs will be responsible for reserving and paying for the site visit team’s accommodations. To offset this cost, the domestic site visit fee was reduced to $825 per day for each peer evaluator assigned to a visit and $1,000 per day for each peer evaluator assigned to international visits. The 2019 Domestic Fees Schedule can be found here, and the 2019 International Fee Schedule can be found here. The Board of Commissioners approved the TTP Standards and Criteria during its July 2018 meeting. Watch for more information on the ACEN website during the coming months! 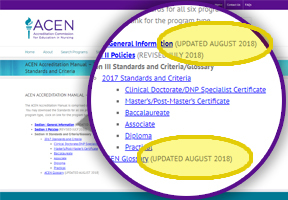 A friendly reminder from your ACEN family: Make sure that you are checking the resources section of the ACEN website from time-to-time to ensure that you are using the most current version of ACEN documents. Next to the link connecting you to the resource you will find a parenthetical note stating the month and year of the latest update. The graphic above illustrates the location. So that you are able to easily compare what you already have printed or downloaded with the version that you see online, you will also find revision dates on the title page within the resource itself. Below is an example of what that typically looks like. 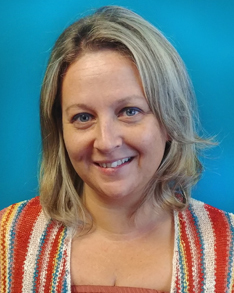 Stephanie Larson has been the ACEN’s Controller for more than four and a half years. Originally from California, she has spent the last 18 years in Georgia together with her family of four children, ranging from ages 14 through 22, a family which as of this June grew to include two little grandchildren, twins Chloe and Ava. What: 2018 OADN Convention, "Population Health: A Vision for Nursing Education"
What: Spring 2019 Self-Study Forum, plus a post-session CEU opportunity, "Taking it to the Next Level: Tackling Standards 4 and 6 Head On"
ACEN 2019 Nursing Education Accreditation Conference, "Merging Accreditation and Innovation"
Q: What is the cost of candidacy and initial accreditation? A: We are pleased to tell you that the rumors are untrue! Candidacy does not require an arm and a leg and your first born child; it is actually an affordable process where fees are billed in portions depending on what part of the process you are in. 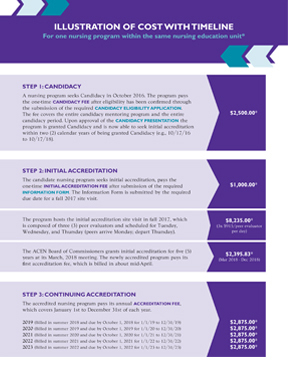 This spring an Illustration of Cost with Timeline was created to clarify the costs associated with candidacy and initial accreditation. It is a PDF document that accompanies the ACEN Schedule of Fees. It can be found on the ACEN website under Resources > Resources for Nursing Programs > ACEN Schedule of Fees. The Accreditation Commission for Education in Nursing (ACEN) is seeking nominations for seven (7) Commissioners for the ACEN Board of Commissioners and one (1) member for the ACEN Nominating Committee. 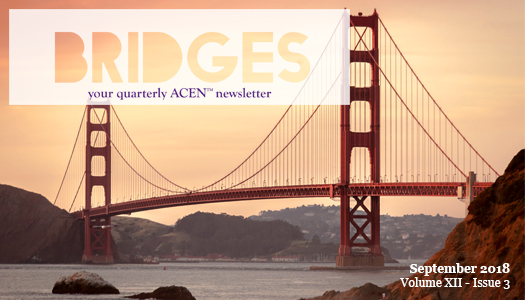 The ACEN values the perspectives of individuals with diverse backgrounds and experiences and seeks to include the broadest range of perspectives within the composition of the Board of Commissioners and the Nominating Committee. The Board of Commissioners is the governing board for the ACEN. 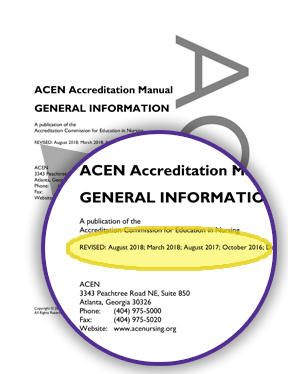 See ACEN Policy #2 Representation on Site Visit Teams, Evaluation Review Panels and the Board of Commissioners for eligibility information to serve as a nurse educator, nurse clinician/practitioner, or member of the public. See ACEN Policy #1 for Conflicts of Interest. See ACEN Bylaws for role and responsibilities of Commissioners. The Nominating Committee prepares the slate of candidates for the ACEN Board of Commissioners from the nominations made. See ACEN Policy #1 for Conflicts of Interest. We encourage you to nominate a colleague or yourself for one of these important leadership positions. Nominations are open from October 1, 2018 and are due to the ACEN office by December 12, 2018. We hope you will consider serving in one of these essential roles in support of nursing education programs. More information about the Board and Committee vacancies, the nomination process, and the application materials that are required is available on the ACEN website at www.acenursing.org. If you haven't subscribed already, click here to sign up for your newsletter and stay informed!